The greatest football match of all time? Maybe. Liverpool and Tottenham are through to the Champions League semi-finals. Manchester City are out. Their hopes of the quadruple are over. Scroll down for reaction and follow the links below to read more. I looked at both managers at the end of the game and they both looked absolutely shattered. Pep Guardiola went down the touchline in celebration and then the game is taken off them. Mauricio Pochettino is off celebrating in front of the away end. Incredible stuff. Tottenham manager Mauricio Pochettino on BT Sport: “It was unbelievable - the way it finished. I am so happy, so proud. My players are heroes to be here. I am so happy for them, so happy for the fans. Speaking to BBC Radio 5 Live, Pep Guardiola said: "It is cruel but it is what it is and we have to accept it. After 20 minutes we were 3-2 up. In the second half we created a lot of chances and we scored the goals we needed. Unfortunately, it was a bad end for us so congratulations to Tottenham and good luck for the semi-finals. On Raheem Sterling's goal that was ruled out: "I watched the action and the people from above decided it was offside. We missed a penalty in the first leg but I am so proud of the players and the fans. I have never heard noise like that since I have been in Manchester but football is unpredictable." Wow. This game had absolutely everything. It was incredible entertainment. Well done to Tottenham to dig in when they had to and getting the goal. They rode their luck here and there and both teams played their part. But the finish to the game was arguably even more amazing. 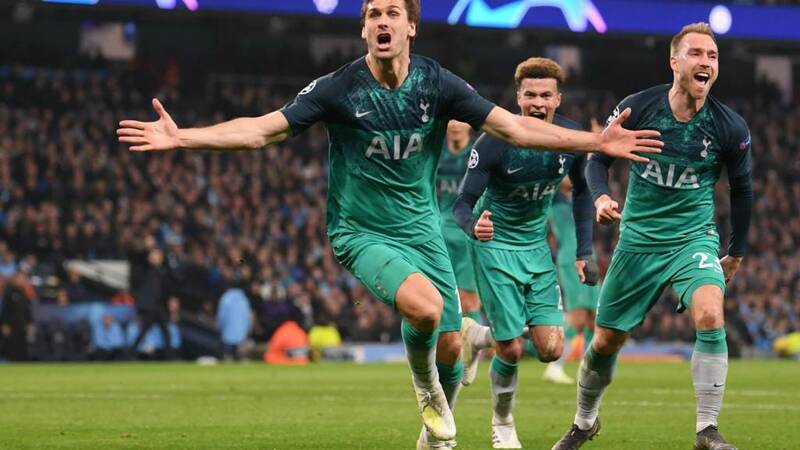 Spurs get their noses in front with Fernando Llorente's controversial goal. It is checked by VAR but allowed. From pandemonium to despair for Man City. How long ago do those five goals in the first 21 minutes seem? SMS Message: City were overly cautious in the first leg after getting hammered at Anfield last year. That was Pep's mistake this year-one away goal at Spurs' ground and there wouldn't have been as much pandemonium tonight. from Jake - a City fan. City were overly cautious in the first leg after getting hammered at Anfield last year. That was Pep's mistake this year-one away goal at Spurs' ground and there wouldn't have been as much pandemonium tonight. Jake - a City fan. Liverpool forward Sadio Mane speaking to BT Sport: "At the beginning it was tough. Everyone was scared on the bench but the team spirit was great, we pushed and finally we scored. "I thought I was offside. It was an important goal but the most important thing was to qualify for the semi-final." Frank Lopez: I feel robbed and victorious at the same time. Spurs and City are such entertaining teams I was rooting for both. The quality of football and management is ridiculously high. As football fans we live in glorious times. Manchester City manager Pep Guardiola on BT Sport: “In first 20 minutes it was 3-2 it is not normal. “It [Sterling’s disallowed goal] was offside. It was cruel. The moment we celebrate and we are so close to the semi-finals. It is what it is. “The first half was good. In the second we created a lot of chances. Spurs are a strong team so it was quite equal. Unfortunately we are not at the next stage. In all seriousness, if you can tell me a better game of football than that one tonight then please do. We'll continue to bring you reaction to tonight's games. But head over here to read all about Spurs victory - the greatest game of all time - in Phil McNulty's match report. It has taken a back seat tonight but Liverpool are through too. Read about their win here. Pep Guardiola will look to the fact that they missed a penalty which was a golden opportunity to get that away goal. There were very fine balance in this match. He will have to get round and rally his players now and a domestic treble will still be a very good season for Manchester City. Spurs forward Heung-min Son is now the highest scoring Asian player in Champions League history with 12 goals, overtaking Maxim Shatskikh of Uzbekistan.